It's a delightful place, really - if you don't mind the hellhounds, the deathkitties, and the exploding winged rabbits. No doubt you were snatched up from your home world by the PIF - it's our resident field of multi-dimensional confusion, a mysterious force that lately has taken to the form of a moose with a platter of spaghetti in its antlers. (Don't ask us why, we don't know.) This pasta-moose has a nasty habit of stealing people away from their planets, and over the years Isnit Weyrd has become the new home to elves, mages, space warriors, and third-grade English teachers (and more!). Absolutely anyone can end up here, which means that you have near endless possibilities when creating your character! And you won't be alone for long. Similar in fashion to Dragonriders of Pern, Isnit allows you to form special soul-bonds with various creatures (we call them shinies). There's no limit to how many you can accumulate. Do you love gryphons? Are you a phoenix fan? Awed by wyverns? They're all here, including a slew of member-created shinies that exist nowhere else! So while you're off trying to get yourself a dragon or a unicorn, you can pause to grab up that armor-wearing raptor or the little trinket fox. With member-driven plots, fun events, and a near-constant stream of bondings, there's always something to do. Chat with our friendly members in the CBox, or plan a plot out in the forest. 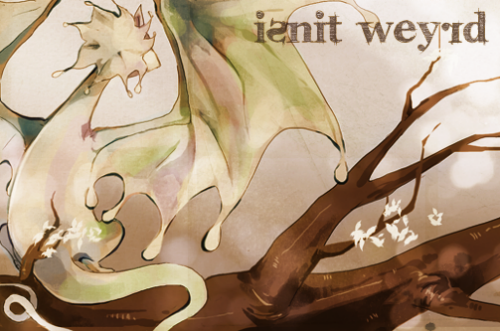 Isnit Weyrd is a place for the imagination to go wild, and it's waiting for you!